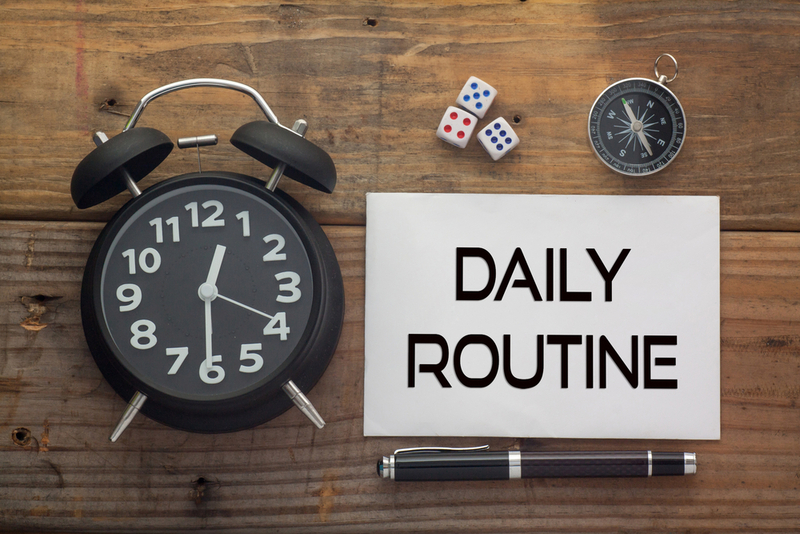 What comes to mind when you think about routine? What comes to mind when you think about routine? Does the idea of routine feel confining and boring? Or does having routine give you a sense of comfort and balance? Whatever thoughts come up for you around routine, there is a way to implement a regular practice and routine in a way that is personalized to you. I have areas of my life that are extremely regimented and routine and other areas that are wide open and free. I love having the balance of both because I have a need for freedom as well as a desire to have structure and order. There is a fine line when deciding how structured or free you want your life to be. The thought of having my whole life planned out and structured feels suffocating. However, the idea of having zero organization and framework for the many moving parts of my life, makes me feel panicked and somewhat itchy. Here comes the easy part. When we take a step back and look at the big picture of our lives, we very quickly see: what is working, what needs shifting, and how the different areas of our life are interconnected. Chances are, you have many moving pieces and areas of your life you attend to in a day. When we take a snapshot of the whole big picture, with all the moving parts — we can quickly see where we need and want to add routine in our lives. There is something about exercising our freedom of choice when it comes to routine that feels more empowering and motivating than being told we should do something. Truth be told, each of us knows better than anyone else what works best for us and what we are most likely to stick with over the long haul. A really useful tool to get a snapshot of your life, is one I often in use in my coaching practice called, Life Wheels. Wheels are a great resource for creating more clarity and awareness. They help you take a current snapshot of your life, and provide you with personalized information you can use to inform your next moves. Wheels can be used to measure all kinds of things in our lives. We can even use them as a tool to help us make decisions by comparing the pros and cons of the decision on two side-by-side wheels. In the case of looking at where you would like to add routine or where you would like to ease off on routine, wheels can also help you create that picture for yourself. Wheels are not meant to be used to judge yourself or to feel like you aren’t measuring up. They are meant to create a picture of what your current level of satisfaction is. They provide you with an honest picture for yourself of what is working well, and what you would like to shift or keep the same. It is a tool that is for you, to be used by you. It is a great way to expand self-awareness. Draw a large circle on a piece of paper. Divide the circle up into 8–10 segments (refer to the example I created if it is helpful to you). Think of all the different areas of your life you spend the most time in and label the wheel with the key areas for each segment (you may have more or less segments than the example, it’s yours by design). Think about your current level of satisfaction in each of the areas, and give each area a numerical value from 1–10 (1 = low, 10 = high). Shade in the different areas with a pen or colored pencils up to the numerical value (see example). Spend some time looking at the overall picture of your wheel. What do you notice? What comes up for you as important? How do all of the different areas in your life affect each other? If you increased the level of satisfaction in one area, how would it influence the other areas? Do you have room to add more routine in any of the areas? Would you like to have less routine and more freedom in any of the areas? How will adding or shifting routine change your level of satisfaction in each area? Will adding or shifting routine change the overall picture of your daily life and your overall level of satisfaction? There is no right or wrong way to do this wheel exercise. It is meant to get you thinking about your life, and more specifically — getting clear if there is room to make simple shifts in the structure of your life. If you do want to make some changes in your routine, this is the opportunity to brainstorm what is going to work for you. Often it is the simple shifts we make that shape the overall level of our happiness. Think of this wheel like it is a tire on a car. Imagine what it would be like if the different areas of the tire weren’t balanced and level — it would surely make for a bumpy ride! When we focus on increasing our happiness in one area of our life, it can have a positive impact on all of the other areas. This overall balance makes our journey smoother and more enjoyable. Creating this picture for yourself is way more valuable than being told what you should do, or what works for me. What works for me may not work for you. So have fun creating your own picture and informing yourself all about what is best for you. At the end of the day, you get to decide how much or how little routine you need in order to feel satisfied in your life. Enjoy! Like what you read? Sign Up for free weekly inspiration with Emily’s featured articles, happiness strategies and videos and receive a free copy of ‘Self-Care Success’ by Emily Madill. If you feel overwhelmed and would like more life-balance and happiness— come check out my coaching packages combined with my E-Course, ‘Fall In Love With Your Life, One Week at a Time’. It’s a chance to create a daily happiness practice that will help you fall in love with your life.